Amidst all of the horrors of the world something beautiful took place yesterday. 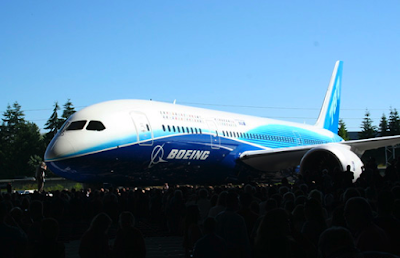 The long overdue first flight of Boeing's new 787 Dreamliner airplane took place yesterday in Seattle. It is an exquisitely beautiful machine, no? It's made up of mostly composite materials and is much lighter than traditional aircraft. It's wings almost resemble a bird?? New commercial aircraft are a rare breed these days. According to Boeing only every decade or so (although I think they left out Airbus planes, including the perfect A380). So yesterday was a special day....the birth of a new aircraft which will usher in a new era of aviation. 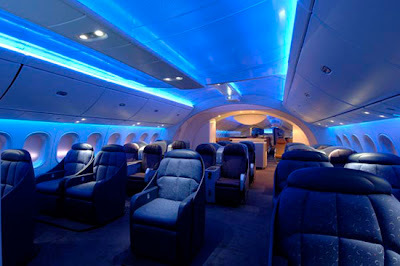 Read more about the Dreamliner to find out just why this will be an historical aircraft. I watched the takeoff live yesterday. It made my day! The photo below is of the plane's first landing. The plane is the fastest selling aircraft in aviation with almost 900 orders currently, before the plane has even received its airworthy certification. The interior will usher in a new era for passenger comfort. Because of the composite material of the body of the aircraft the plane will not need to be pressurized at as high an altitude which will dramatically decrease passenger jet lag. The windows will be larger (I love large windows...see my post on the Gulfstream). The cabin will be more open. This is a really gorgeous plane. 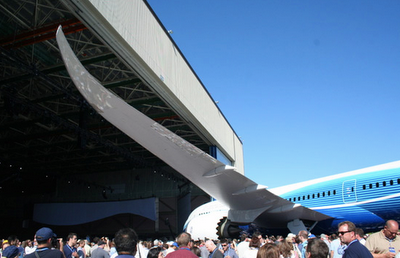 It is designed to replace Boeing's 767 aircraft. It has two aisles and can fly long distance international routes, like the big boys 747 and A380, but with a lot few passengers. The aircraft will carry 200-290 passengers depending upon the configuration and model of the aircraft. Please visit the Boeing website to see this beautiful plane and find out more. Wonder if Roman Abramovich will also order one of these as a private jet (see my previous posting on the A380 private jet). I still think it a damn shame that our stupid species hasn't created a new breed of supersonic passenger jets after the demise of the pioneering Concord SST. It is one of the few examples in human history of mankind taking several giant step backwards. Maybe Boeing's only number left: the 797 will be supersonic jet?